This was an inherited system from Betty Izant, who was the Festival’s first administrator during Lawrence Morton’s tenure as Artistic Director. Betty had an almost photographic memory for Festival-goers and could remember their names exact seats with incredible precision. Back then, records were meticulously kept on index cards and updated by hand with new information each year. Needless to say, things are much easier now. All seating information is stored in our computer system and ticket buyers can even purchase seats online (something almost unheard of only five years ago!). 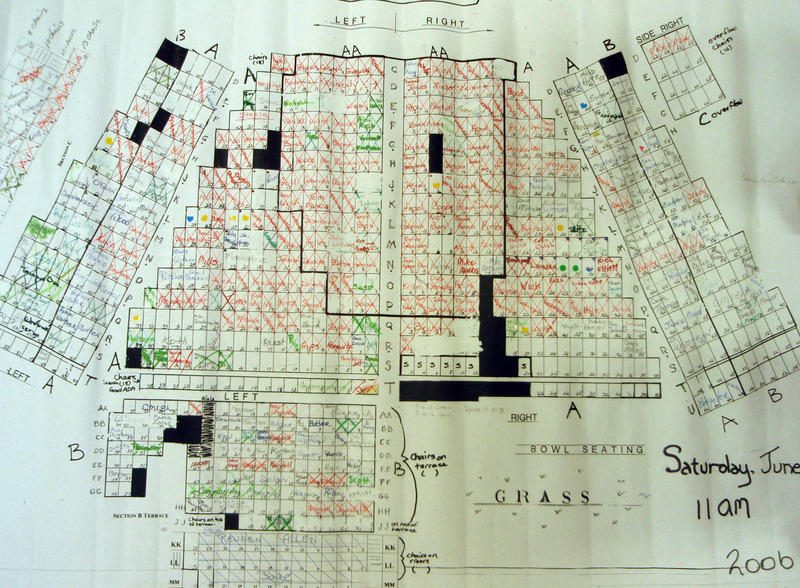 The one thing that hasn’t changed, however, is the care and attention that we give when seating patrons for each year’s Festival.The seating for this year’s 2012 Festival will be especially interesting, as we’re already close to selling out the AA and A sections of Libbey Bowl. If you haven’t yet bought your tickets, you can do so online here or by calling me in the Box Office at (805) 646-2053.